The Squier by Fender Bullet Stratocaster with Hard Tail features all the iconic design features of the Stratocaster family. As one of the first electric guitar designs, the Stratocaster is ingrained in the public’s collective consciousness and has been found in the hands of countless players in all genres of music. 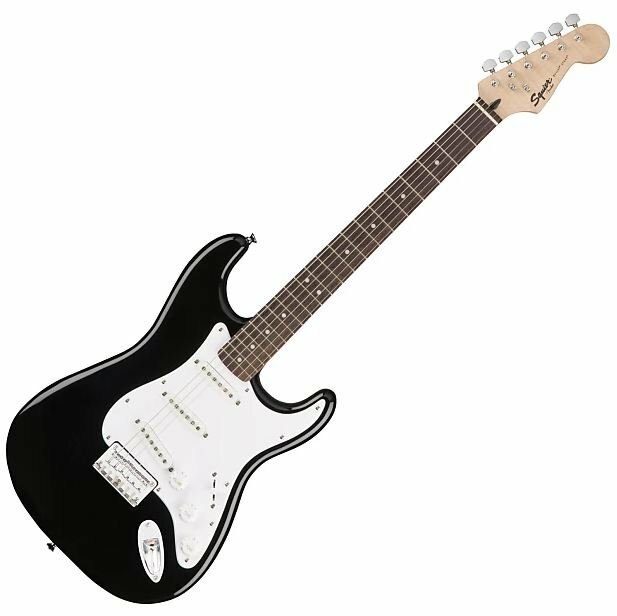 The Bullet Stratocaster gives you a great-value entry point into the Fender family, and it features all the classic appointments which make the Stratocaster such a popular design. The Bullet Stratocaster is crafted with a basswood body; a versatile and lightweight tonewood chosen for its balanced frequency response. It has contours in all the right places, helping you sit and stand comfortably with the instrument while enabling easy access to the whole length of the fingerboard. The neck is made of maple and topped with a rosewood fingerboard. The neck has a comfortable “C” shaped profile that sits easily in the left hand and gives a fast playing feel with the 9.5” radius fingerboard. The Bullet Stratocaster is loaded with 3 single coil pickups and a 5-way pickup selector. This gives you 5 distinct tones to choose between, with biting bridge-position sounds, mellow neck-position tones, and all manner of in-between sounds which will instantly remind you of countless recordings. This pickup combination is incredibly versatile and partly the reason why the Stratocaster is often chosen as a session player’s guitar, and by other artists in almost every genre of music. The only limits are your imagination. The Bullet Stratocaster has a hard tail bridge, which means it is locked to the guitar and creates an inherently more stable platform. Along with the improved machine heads, this combination ensures you’ll stay in tune for as long as possible during longer playing sessions; ideal for practicing, rehearsing and gigging.